Department of Microbiology and Molecular Genetics, and Center for Evolutionary Biology and Medicine, University of Pittsburgh, Pittsburgh, Pennsylvania, USA. Department of Microbiology and Molecular Genetics, and Center for Evolutionary Biology and Medicine, University of Pittsburgh, Pittsburgh, Pennsylvania, USA.Microbial Genome Sequencing Center, University of Pittsburgh, Pittsburgh, Pennsylvania, USA. Department of Microbiology and Molecular Genetics, and Center for Evolutionary Biology and Medicine, University of Pittsburgh, Pittsburgh, Pennsylvania, USA.Microbial Genome Sequencing Center, University of Pittsburgh, Pittsburgh, Pennsylvania, USA.Center for Evolutionary Biology and Medicine, University of Pittsburgh, Pittsburgh, Pennsylvania, USA. Many opportunistic pathogens live in surface-attached communities called biofilms that generate ecological structure and can increase stress tolerance. Theory suggests that bacterial populations evolving in biofilms may harbor greater genetic diversity and become resistant to antibiotics by different pathways than in well-mixed environments. 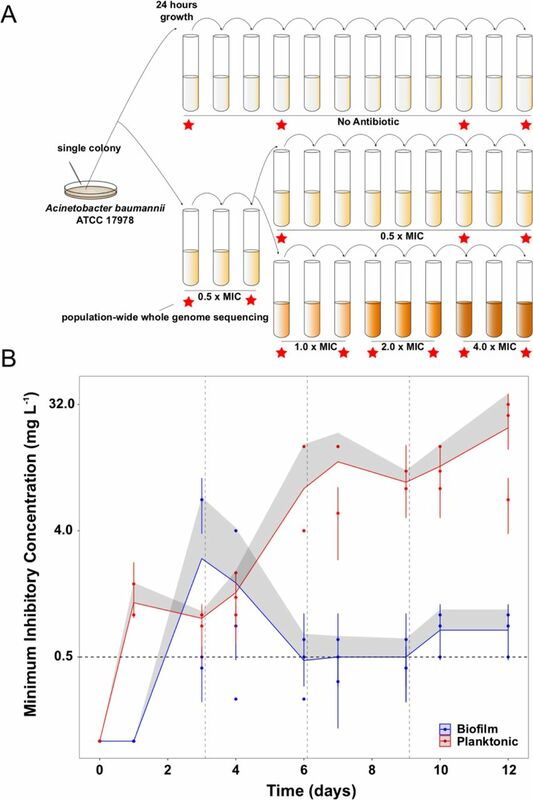 We used experimental evolution and whole genome sequencing to test how the mode of growth influences dynamics and mechanisms of antibiotic resistance in Acinetobacter baumannii populations. Biofilm and planktonic populations were propagated under conditions lacking antibiotics, under constant sub-inhibitory concentrations of ciprofloxacin, or under steadily increasing concentrations of this drug. As predicted, both the evolutionary dynamics and the identities of selected mutations differed between treatments and lifestyle. Planktonic populations exposed to ciprofloxacin underwent sequential selective sweeps of single mutations including the primary drug targets, gyrA and parC. In contrast, biofilm-adapted populations diversified by multiple contending mutations in regulators of efflux pumps. Mutants isolated from both lifestyles exhibited a trade-off between fitness and resistance level, wherein biofilm-adapted clones were less resistant but more fit in the absence of drug. Further, biofilm-adapted populations evolved collateral sensitivity to cephalosporins whereas the planktonic populations displayed cross-resistance with several classes of antibiotics. This study demonstrates that growth in biofilms, arguably the predominant bacterial lifestyle, may substantially alter the routes, dynamics, and consequences of the evolution of antibiotic resistance and is therefore an important consideration when treating infections. Antimicrobial resistance (AMR) is one of the main challenges facing modern medicine. The emergence and rapid dissemination of resistant bacteria is decreasing the effectiveness of antibiotics and it is estimated that 700,000 people die per year due to AMR-related problems (1). AMR, like all phenotypes, is an evolved property, either the ancient product of living amidst other microbial producers of antimicrobials (2), or the recent product of strong selection by human activities for novel resistance-generating mutations (3). AMR can be acquired via two principal routes: horizontally, when AMR genes are acquired from other bacteria; or vertically, where the resistance mechanism originates by de novo mutation and is inherited by the progeny. These vertically inherited, novel evolved resistance mechanisms are the focus of this study. Here, we study the evolutionary dynamics and effects of new resistance mutations in the opportunistic nosocomial pathogen Acinetobacter baumannii, which is often intrinsically resistant to antibiotics or has been reported to rapidly evolve resistance to them (4). This pathogen is categorized as one of the highest threats to patient safety (5), partly due to its ability to live on inanimate surfaces in biofilms, which are surface-attached communities protected from external stresses by secreted polymers (6). The biofilm lifestyle is central to AMR (7–9). Microbes that are surface-bound and encased in secreted polymers are less susceptible to compounds that fail to penetrate the matrix or can persist through the lower metabolic rate of biofilm residents (7, 8, 10). But what is less understood or appreciated is that the physical and ecological heterogeneity of biofilms can influence the evolutionary dynamics of microbial populations in multiple ways. First, the protective effect of biofilms could reduce the strength of selection for resistance by reducing the effective antibiotic concentration. This would modify the rate of adaptation to a particular drug since it has been observed that subinhibitory concentrations of antibiotic may select for multiple mutations with low fitness costs (11, 12). Second, the spatial structure of subpopulations within biofilms may facilitate greater genetic diversity (13–16), either by the effect of structure alone allowing independent lineages of varied fitness to coexist, or by adaptive diversification to inhabit discrete niches in the heterogeneous biofilm environment (17). For example, bacteria or yeasts evolving in biofilms became more diverse than in planktonic cultures (15, 18) which could improve the capacity of these populations to respond to new selective forces (19). Third, life in biofilms may align selective forces on traits that were formerly opposed and increase the efficiency of adaptation (20, 21). For example, bacteria growing in a planktonic environment may experience selection for rapid growth, and this can make these cells more susceptible to antimicrobials that are more effective on metabolically active cells. However, bacteria dwelling in biofilms experience selection for life in crowded, resource-limited conditions, and adaptation to slow growth may actually also generate antimicrobial resistance by limiting the availability of molecular drug targets. Therefore, in biofilms, growth and resistance may become aligned traits that can jointly improve, and the transition from planktonic growth to biofilms can theoretically change the form of pleiotropy between resistance and fitness (22). The potential for different evolutionary dynamics in biofilms is clinically significant. Biofilm-associated bacteria are particularly challenging in chronic infections (23, 24), where biofilm adaptations increase virulence and resistance (6, 25). Yet with few exceptions (9, 16, 26) most of the research on the evolution of AMR has been conducted in well-mixed populations [see review (27)] or on agar plates (28), conditions that cannot simulate the effects of biofilms on the evolution of AMR. We experimentally propagated populations of A. baumannii exposed either to subinhibitory or increasing concentrations of ciprofloxacin (CIP) over 12 days in biofilm or planktonic conditions to ascertain whether these lifestyles select for different mechanisms of AMR. Rather than focusing on the genotypes of single isolates, which can limit the scope of an analysis, we conducted whole-population genomic sequencing over time to define the dynamics of adaptation and the fitness of certain resistance alleles compared to others in the experiment. We then identified clones with specific genotypes that we linked to fitness and resistance phenotypes. This approach sheds new light on the ways that pathogens adapt to antibiotics while growing in biofilms and has implications for treatment decisions. Replicate cultures of the susceptible A. baumannii strain ATCC 17978 (29, 30) were established under planktonic or biofilm conditions in one of three treatments: i) no antibiotics, ii) sub-inhibitory concentration of the antibiotic ciprofloxacin (CIP) and iii) evolutionary rescue (31) in which CIP concentrations were increased every 72 hours from subinhibitory concentrations to four times the minimum inhibitory concentration (MIC) (Figure 1A). CIP was chosen because of its clinical importance in treating A. baumannii (4, 32, 33), its ability to penetrate the biofilm matrix (34) allowing similar efficacy in well mixed and structured populations (35), and because it is not known to stimulate biofilm formation in A. baumannii (36). Planktonic populations were serially passaged by daily 1:100 dilution while biofilm populations were propagated using a bead model simulating the biofilm life cycle (13, 17, 37). This model selects for bacteria that attach to a 7mm polystyrene bead, form a biofilm, and then disperse to colonize a new bead each day. The transfer population size in biofilm and in planktonic cultures was set to be nearly equivalent at the beginning of the experiment (approximately 1×107 CFU/ml), because population size influences mutation availability and the response to selection (38, 39). The mutational dynamics of three lineages from each treatment were tracked by whole-population genomic sequencing (Figure 1A). We also sequenced 49 single clones isolated from 22 populations at the end of the 12-day experiment to determine mutation linkage. Figure 1. Experimental design (A) and dynamics of evolved resistance levels during the evolutionary rescue experiment (B). A) A single clone of A. baumannii ATCC 17978 was propagated both in biofilm and planktonic conditions for 12 days under no antibiotics (top), subinhibitory concentrations of CIP (0.0625 mg/L = 0.5x MIC) (middle) or in increasing concentrations of CIP (bottom). For the latter, termed evolutionary rescue, the concentration of CIP was doubled from 0.5 × MIC to 4.0 × MIC every 72 hours. As a control, five populations of A. baumannii ATCC 17978 were propagated in biofilm and five in planktonic in the absence of antibiotics. We estimated the MICs to CIP and froze the populations for sequencing before and after doubling the antibiotic concentrations (red stars). B) MICs (mg/L) of CIP were measured for replicate populations during the evolutionary rescue. The red and blue points represent the MICs of three populations propagated in planktonic or biofilm, respectively, with the 95% CI represented by the error bars. The red and blue lines represent the grand mean of the three planktonic and biofilm populations, respectively, with the upper 95% CI indicated by the grey shaded area. Horizontal dashed line indicates the highest CIP exposure during the experiment (4x MIC) and vertical lines indicate time when CIP concentration was doubled. Passaging bacterial populations in the presence of antibiotics will select for fitter, more resistant mutants if the populations do not go extinct. The rate and extent of evolved resistance depends on the strength of antibiotic selection (12, 40), the distribution of fitness effects of mutations that increase resistance to the drug (41), and the population size of replicating bacteria (38, 39). The mode of bacterial growth may alter each of these three variables, in theory generating different dynamics and magnitudes of AMR. In the populations exposed to the increasing concentrations of CIP (the evolutionary rescue), the magnitude of evolved CIP resistance differed substantially between planktonic and biofilm populations. Planktonic populations became approximately 160x more resistant on average than the ancestral clone while the biofilm populations became only 6x more resistant (Figure 1B and Table S1). Planktonic populations also evolved resistance much more rapidly, becoming 10x more resistant after only 24 hours of growth in sub-inhibitory CIP. This level of resistance would have been sufficient for surviving the remainder of the experiment, but MICs continued to increase at each sampling (Figure 1B). The evolution of resistance far beyond the selective requirement indicates that mutations conferring higher resistance also increased fitness in planktonic populations exposed to CIP. In contrast, biofilm-evolved populations evolved under the evolutionary rescue regime acquired much lower levels of resistance (ca. 3– 7x the ancestral MIC) and primarily in a single step between days 3 and 4 (Figure 1B). In one notable exception, the MIC of biofilm population B2 increased ∼50x after 3 days of selection in subinhibitory concentrations of CIP (Figure 1B), but then the resistance of this population declined to only 6x higher than the ancestral strain. This dynamic suggested that a mutant conferring high-level resistance rose to intermediate frequency but was replaced by a more fit, yet less resistant, mutant (this possibility is evaluated below). Lower levels of resistance were observed in populations selected at subinhibitory concentrations of CIP. Biofilm populations were 4x more resistant than the ancestor and planktonic populations were 20x more resistant (Table S1). We can infer that biofilm growth does not select for the high-level resistance seen in planktonic populations, instead favoring mutants that would barely survive at their selected CIP concentration if not grown in biofilms. It is important to note that these MIC measurements were made in planktonic conditions according to the clinical standards (42) and that these values increased greater than 100x when measured in biofilm (Table S2). Our results correspond with studies of clinical isolates in which those producing more biofilm (and likely having adapted in biofilm conditions) were less resistant than non-biofilm-forming isolates (43). However, growth and context-dependent MIC measurements are important (35, 44, 45) and the biofilm environment at least partially protects cells from antibiotic exposure (Table S2). Furthermore, these results demonstrate that exposing bacteria to low levels of antibiotic risks selection for high levels of resistance that can make future treatment more difficult (11). In large bacterial populations (>105 cells) growing under strong selection, adaptive mutations conferring beneficial traits (such as antibiotic resistance) will dominate population dynamics (38, 46). Therefore, if a single mutation renders the antibiotic ineffective and provides the highest fitness gain, it would be expected to outcompete all other less fit mutations. Further, the stronger the selection for resistance, the greater the probability of genetic parallelism – or the repeated evolution of the same gene, domain, or even residue providing the best adaptation – among replicate populations (47). Under the conditions of these experiments, approximately 106 mutations occur in the first growth cycle and roughly 107 mutations arise over the 12 days of selection, leading to a probability of 0.98 that every site in the 4Mbp A. baumannii genome experiences a mutation at least once over the course of the 12 day experiment (see Table S3 for details of these calculations). The dramatic differences in the evolved resistance levels of planktonic and biofilm populations suggested distinct genetic causes of resistance resulting from different selective forces in these treatments. We also predicted to observe greater genetic diversity in the biofilm treatments than in the planktonic cultures. Whereas in well-mixed populations one or few genotypes outcompetes the other genotypes and quickly achieves fixation (48), in structured environments like biofilms, multiple beneficial mutations may arise to high frequency and persist, with potentially none fixing owing to spatial structure and niche differentiation (13). We conducted whole-population genomic sequencing of three replicates per treatment to identify all contending mutations above a detection threshold of 5% (see Methods). The spectrum of mutations from CIP-treated populations are consistent with expectations from strong positive selection on altered or disrupted coding sequences (see Table 1 for day-12 results and Table S4 for dynamics across the experiment). High nonsynonymous to synonymous mutation ratios were observed in both lifestyles (8.5 in planktonic and 9.7 in biofilm). 43% of the total mutations in planktonic and 34% in biofilm were insertions or deletions, which is vastly enriched over typical mutation rates of ∼10 SNPs/indel under neutral conditions (49, 50). Roughly 30% of the mutations in CIP-treated populations of either lifestyle occurred in intergenic regions (30% in planktonic-propagated populations and 32% in biofilm ones). Of the intergenic mutations, 72% of the planktonic mutations and 18% of the biofilm mutations occurred in promoters, 5’ untranslated regions, or in putative terminators (51). Table 1. Mutation spectrum of different selective environments. Attributes of the contending mutations during the 12 days of the evolution experiment. aResults from the last day of the experimental evolution. bAccounting for all unique mutations detected after filtering (see methods). For mutation dynamics over time, see Table S3. As expected from theory, in CIP-selected planktonic populations one or two mutations rapidly outcompeted others and fixed (Figure 2). Selection in biofilms, however, produced fewer selective sweeps and maintained more contending mutations, especially at lower antibiotic concentrations. Overall, across all treatments and timepoints, biofilm-adapted populations were significantly more diverse than the planktonic-adapted populations (Shannon index; Kruskal Wallis, chi-squared = 7.723, p = 0.005), particularly at subinhibitory concentrations of CIP (Figure S1A). Notably, increasing drug concentrations eliminated the differences in diversity between treatments (Figure S1B). Consistent with theory, the spatial structure in biofilms generated more initial standing diversity for selection to act upon. This higher standing diversity is important when considering dosing and when antibiotic exposure may be low (e.g. in the external environment or when bound to tissues) (52, 53) because biofilms with more allelic diversity have a greater chance of survival to drug and immune attack (19). Figure 2. Lifestyle-dependent mutations and dynamics under increasing CIP selection. Mutation frequencies in planktonic (A and C) and biofilm populations (B and D) over time as determined by population-wide whole genome sequencing. A) and B) show the mutation frequencies obtained under increasing concentrations of CIP. From left to right: P1, P2 and P3 in A) and B1, B2 and B3 in B). C) and D) show the mutation frequencies obtained under the subinhibitory (top) and no antibiotic (bottom) treatments. Mutations in the same gene share a color. Blue: adeN or genes regulated by adeN; green: adeL; gold: MFS putative transporter ACX60_RS15145; purple: adeS; pink: sohB; red: gyrA; and orange: parC. Grey and brown colors indicate genes potentially unrelated to adaptation to CIP. F) Mutated genes in the sequenced clones. Each column represents one clone. Grey shading of populations indicates whole population sequencing and N1 and N2 indicate populations where only clones were sequenced. Grey shaded clones were used for MIC and fitness estimations. Blue and red indicate SNPs in biofilm and planktonic growing populations respectively. For all SNPs identified in the 49 clones, see Figure S2 and Table S6. G) The genetic organization of the RND efflux pumps is shown on the left. MFP and OMP denote membrane fusion protein and outer membrane protein respectively. All mutations found in the RND regulators are shown on the right. In contrast with the data observed in the populations evolving under CIP pressure, drug-free control populations contained no mutations that achieved high frequency during the experiment (Figures 2C and 2D). These results suggest that the ancestral starting clone was already well-adapted to our experimental conditions, perhaps because we had previously propagated the A. baumannii ATCC 17978 clone under identical drug-free conditions for 10 days. This preadaptation phase led to the fixation of mutations in three genes (Table S5). A. baumannii clinical samples acquire resistance to CIP by two principal mechanisms: modification of the direct antibiotic targets — gyrase A or B and topoisomerase IV — or by the overexpression of efflux pumps reducing the intracellular concentrations of the antibiotic (4). To directly associate genotypes with resistance phenotypes, we sequenced 49 clones isolated at the end of the experiment, the majority of which were selected to delineate genotypes in the evolutionary rescue populations (Figures 2F and S2). Both the genetic targets and mutational dynamics of selection in planktonic and biofilm environments differed. Mutations disrupting three negative regulators of efflux pumps evolved in parallel across populations exposed to CIP, but mutations in two of these (adeL and adeS) were nearly exclusive to biofilm clones (Figure 2F). The most common and highest frequency mutations observed in the biofilm populations were in the repressor gene adeL (Figures 2F, S2, and Table S6), which regulates AdeFGH, one of three resistance-nodulation-division (RND) efflux pump systems in A. baumannii (54–56). In the planktonic lines, the predominant mutations were found in adeN, which is a negative regulator of AdeIJK and were mainly IS701 insertions that disrupted the gene (57). In biofilm lines, different contending adeL mutations were detected in each replicate after 24 hours then eventually fixed as CIP concentrations increased (green lines in Figure 2B), sometimes along with a secondary adeL mutation. This pattern suggests that altering efflux via adeL generates adaptations to the combination of CIP and biofilm. Further, mutants with higher resistance than necessary were evidently maladaptive in the biofilm treatment. For example, adeN (found more often in planktonic culture) and adeS mutations found simultaneously on day 3 in population B2 (Figure 2) led to a spike in resistance at that timepoint (Figure 1), but these alleles were subsequently outcompeted by adeL mutants that were evidently more fit despite lower resistance. In contrast to the biofilm populations, all planktonic populations with increasing concentrations of CIP eventually acquired a single high frequency mutation in gyrA (S81L), the canonical ciprofloxacin-resistant mutation in DNA gyrase. These gyrA mutations evolved in the genetic background containing either an adeN mutant or a pgpB mutant. pgpB is gene that encodes a putative membrane associated lipid phosphatase that is co-regulated by adeN (58). Other mutations associated with high levels of resistance affected parC, encoding topoisomerase IV, and regulatory regions of two putative transporters, ACX60_RS15145 and ACX60_RS1613, the latter being co-transcribed with the multidrug efflux pump abeM (59). Few other mutations exceeded 10% of the total population in the planktonic lines. The rapid fixation of adeN and adeN-regulated alleles in the planktonic CIP-exposed populations indicate that adeN conferred higher fitness than other CIP-resistant mutations at low drug concentrations, as the population size is sufficiently large that these other mutations occurred in the populations (38, 60) and their absence implies they were less fit. Subsequently, at increased concentrations of CIP, on-target mutations in gyrA were favored. Together, our results demonstrate that bacterial lifestyle influences the evolutionary dynamics and targets of selection of AMR. 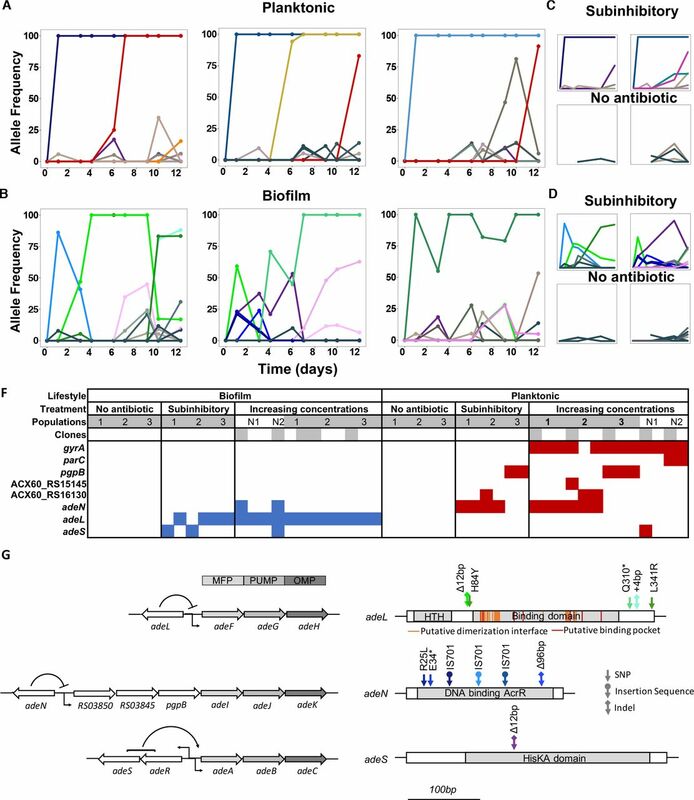 Loss-of-function mutations in regulators of the adeFGH and adeABC RND efflux pumps that increased CIP resistance ∼4-fold in biofilm populations treated with CIP. Adaptation by planktonic populations exposed to CIP proceeded first by altering the adeN-controlled adeIJK efflux pump and then by directly altering the targets of the fluoroquinolone, gyrA and parC, leading to much higher levels of resistance. The large population sizes (107 – 109 cells) and number of generations (∼100) in all evolved lines mean that similar mutations very likely arose in each replicate regardless of treatment, meaning that the success of some mutations over others reflects their greater fitness in that condition (Table S3) (38). Yet de novo acquired antibiotic resistance is often associated with a fitness cost in the absence of antibiotics (61). The extent of this cost and the ability to compensate for it by secondary mutations (compensatory evolution) is a key attribute determining the spread and maintenance of the resistance mechanism (41, 61–63). A negative correlation between CIP resistance and fitness of resistant genotypes in the absence of antibiotics has been previously described in Escherichia coli, suggesting a trade-off between these traits (64–66). To determine the relationship between resistance and fitness in the absence of antibiotics in our experiment, we chose 10 clones (5 each from biofilm and planktonic populations, Figures 2F and S2) with different genotypes and putative resistance mechanisms and measured their resistance and fitness phenotypes in both planktonic and biofilm conditions (Figure 3). As expected from the populations (Figure 1B), the biofilm clones much were less resistant in planktonic conditions than those evolved planktonically [MIC = 0.58 mg/L (SEM = 0.13) vs. MIC = 8.53 mg/L (SEM = 1.96), two-tailed t-test: p < 0.05, t = 4.048, df = 80]. However, biofilm-evolved clones were more fit relative to the ancestral strain than the planktonic-evolved clones in the absence of antibiotic (two-tailed t-test: p = 0.008, t = 2.984 df = 18) (Figure 3). 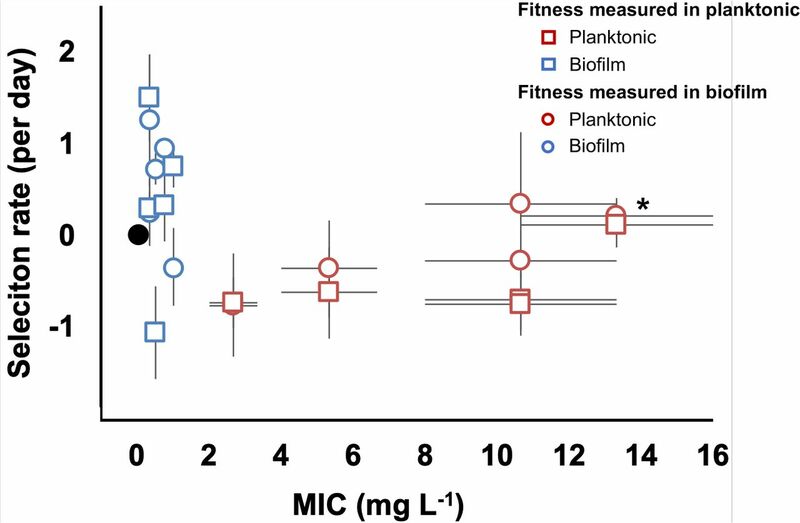 Importantly, these fitness measurements were made in both planktonic and biofilm conditions, demonstrating that even in the lifestyle selection environment they evolved in, the planktonic selected clones were less fit as a result of antibiotic resistance trade-offs. However, one planktonic-evolved clone with mutations in both gyrA and parC exhibited no significant fitness cost and high levels of resistance. This suggests that, as in Pseudomonas aeruginosa, the parC mutation may compensate for the cost imposed by gyrA mutation (67), an example of sign epistasis (68). 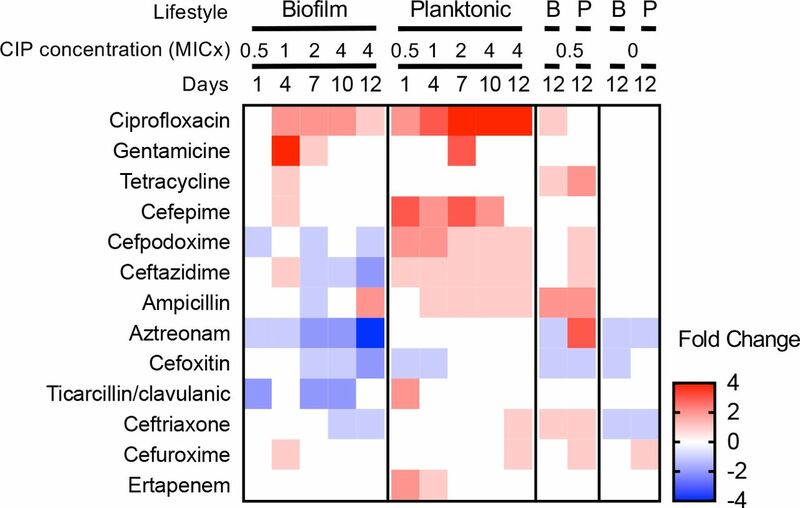 Overall, mutants selected in biofilm-evolved populations were less resistant than mutants selected in planktonic populations (Figure 1B) but produced more biofilm (Figure S3) and paid little or no fitness cost in the absence of antibiotics (Figures 3). This cost-free resistance implies that these subpopulations could persist in the absence of drug, limiting the treatment options and demanding new approaches to treat high fitness, resistant pathogens (69). Figure 3. Evolved trade-off between resistance level and fitness. Relative fitness (average ± SEM) of 10 evolved clones from the evolutionary rescue experiment compared to the ancestor and their MICs (mg/L) to CIP. Fitness was measured in both planktonic (squares) and biofilm (circles) conditions. Biofilm-evolved mutants were more fit than the ancestor in the absence of CIP, either in planktonic (two-tailed t-test: p = 0.1675, t = 1.518 df = 8) or in biofilm conditions (two-tailed t-test: p = 0.1674, t = 1.519 df = 8). MICs were estimated in planktonic conditions. Black dot represents the ancestral clone. *Denotes the clone with gyrA and parC mutations. When a bacterium acquires resistance to one antibiotic, the mechanism of resistance can also confer resistance to other antibiotics (cross-resistance) or increase the susceptibility to other antibiotics (collateral sensitivity) (70). We tested the MIC of the evolved populations to 23 different antibiotics. We observed changes in susceptibilities to 13 of the 23 antibiotics tested, and these changes were growth mode dependent (Figure 4). For example, planktonic populations exhibited cross resistance to cefpodoxime and ceftazidime but biofilm populations evolved collateral sensitivity to these cephalosporins. Cross-resistance was associated genetically with adeN, adeS, gyrA or pgpB mutations, and collateral sensitivity was associated with adeL mutations. Selection in these environments evidently favors the activation of different efflux pumps or modified targets that have different pleiotropic consequences for multidrug resistance (71). Figure 4. Collateral sensitivities and cross resistances to various antibiotics. Heat map showing the relative changes in antimicrobial susceptibility to 13 of the 23 antibiotics tested in the evolved populations (those not shown had no changes). Results shown are the median values of the fold change in the evolved populations compared to the ancestral strain. For subinhibitory and no-antibiotic treatments, only day 12 is shown. The mechanisms leading to collateral sensitivity are still poorly understood but they depend on the genetic background of the strain, the nature of the resistance mechanisms (72, 73), and the specific physiological context of the cells (74). In A. baumannii, each RND efflux pump is specific for certain classes of antibiotics (74–76). Similar to our results (Figure 4), Yoon and collaborators demonstrated that efflux pumps AdeABC and AdeIJK, regulated by adeS and adeN respectively, increased the resistance level to some beta-lactams when overexpressed (77). However, production of AdeFGH, the efflux pump regulated by adeL, decreased resistance to some beta-lactams and other families of antibiotics or detergents by an unknown mechanism (74, 77). Even with the previously demonstrated relationship between active proton pumps and the increase of sensitivity to beta-lactams in P. aeruginosa (78), a clearer understanding of the physiological basis of collateral sensitivity is important for using these features to control AMR evolution. Nevertheless, treatments that exploit collateral sensitivity have been proposed to counteract the evolution of resistant populations both in bacteria (79–81) and in cancer (82). Here, we show that bacterial lifestyle influences these selective pressures and that biofilm growth, commonly thought to broaden resistance, may actually generate collateral sensitivity during treatment with CIP and potentially other fluoroquinolones. Our results demonstrate that the mode of growth determines both the mechanism of evolved resistance and the spectrum of sensitivity to other families of antibiotics. Additionally, we argue that the mutations selected in our experimental conditions also play an important role in clinical samples, as fluoroquinolone resistance mediated by plasmids in A. baumannii appears to be rare (83). The mutations S81L in gyrA and S80L in parC acquired by the sensitive ATCC 17978 strain used in this study have been reported worldwide as the primary mechanism conferring high levels of resistance to fluorquinolones in clinical isolates (84–86). In addition to the on-target mechanisms of resistance through gyrase or topoisomerase mutations, A. baumannii isolates acquire comparatively moderate levels of fluoroquinolone resistance by modifications in the RND efflux pumps. These RND efflux pumps have overlapping yet differing substrate profiles and may act synergistically in increasing the resistance level (Table S7) (54, 55, 87, 88). In our experiment, all biofilm and planktonic populations and nearly all clones isolated had acquired mutations in at least one of the three regulators of the RND efflux pumps (adeL, adeS, adeN) or in a gene regulated by one of these regulators (pgpB). Mutations in adeL upregulate the expression of the RND efflux pump AdeFGH (Figure 2, Table S7), leading to a multidrug resistant phenotype in clinical isolates (54–56, 74). Further, AdeL-AdeFGH has been previously described as a clinically-relevant resistance factor and the genes are often highly expressed in clinical isolates, indicating possible adaptation to the biofilm lifestyle (54, 55). Relevant to the selective conditions in our biofilm treatment, overexpression of adeG is predicted to enhance transport of acylated homoserine lactones, including quorum-sensing autoinducers, increasing both drug resistance and biofilm formation (89, 90). However, in clinical isolates, overexpression of the AdeFGH pump is less common than the AdeIJK efflux pump that is regulated by adeN (77, 88). Interestingly, AdeIJK contributes to resistance to biocides, hospital disinfectants, and to both intrinsic and acquired antibiotic resistance in A. baumannii (87, 88) and may decrease biofilm formation (77). Perhaps more importantly, this study demonstrates that the overexpression of RND efflux pumps may produce little fitness cost in A. baumannii, as has previously been demonstrated in both P. aeruginosa and Neisseria gonorrhoeae (91, 92). We used experimental evolution of the opportunistic pathogen A. baumannii in both well-mixed and biofilm conditions to examine how lifestyle influences the dynamics, genetic mechanisms, and direct and pleiotropic effects of resistance to a common antibiotic. Experimental evolution is a powerful method of screening naturally arising genetic variation for mutants that are the best fit in any condition (38, 93, 94). When population sizes are large and reproductive rates are rapid, as they were here, the probability that all possible single-step mutations that can increase both resistance and fitness occurred in each population becomes nearly certain. The enrichment of the few mutations reported here as well as their ordering with increasing CIP concentrations demonstrates that these are the best such mutations in this A. baumannii strain and set of environmental conditions, and the prevalence of some of these mutations in clinical samples illustrates that they too may have been exposed to selection in biofilms. Likewise, the absence of other mutations reported in shotgun mutant screens of resistance in A. baumannii (95) means that these missing mutants engendered less resistance, fitness, or both. Experimental evolution can be used in a wide variety of conditions, including in susceptible hosts, to identify the most probable mutants that would be selected for under antibiotic treatment and ultimately to enable forecasting of treatment outcomes, including the diversification of the pathogen population and the likelihood of collateral sensitivity or cross-resistance. Furthermore, knowledge of the prevailing lifestyle of the pathogen population may be critically important for treatment design. Most infections are likely caused by surface-attached populations (23, 24), and some treatments include cycling antibiotics that promote biofilm as a primary response. For example, tobramycin is used for treating P. aeruginosa in cystic fibrosis patients (96) and promotes biofilm formation (97, 98), wherein the evolution of antibiotic resistance without a detectable fitness cost may arise during treatment. But the more diverse, biofilm-adapted lineages in our experiments revealed a striking vulnerability to cephalosporins, which could provide a new strategy for treatment. Broader still, conventional wisdom has long held that the relationship between resistance and fitness is antagonistic, and that the efficacy of many antimicrobials is aided by a severe fitness cost of resistance (27, 61, 69). This study demonstrates that the form of the relationship between fitness and resistance can be altered by the mode of growth, whereby biofilms can align resistance and fitness traits. Therefore, a clearer picture of how the fitness landscape of various resistance pathways depends on the environment, including both drug type and growth mode, and could be a valuable forecasting tool in our armament to stem the rising AMR tide. Before the start of the antibiotic evolution experiment, we planktonically propagated one clone of the susceptible A. baumannii strain ATCC 17978-mff (29, 30) in a modified M9 medium (referred to as M9+) containing 0.37 mM CaCl2, 8.7 mM MgSO4, 42.2 mM Na2HPO4, 22 mM KH2PO4, 21.7mM NaCl, 18.7 mM NH4Cl and 0.2 g/L glucose and supplemented with 20 mL/L MEM essential amino acids (Gibco 11130051), 10 mL/L MEM nonessential amino acids (Gibco 11140050), and 10 mL each of trace mineral solutions A, B, and C (Corning 25021-3Cl). This preadaptation phase was conducted in the absence of antibiotics for 10 days (ca. 66 generations) with a dilution factor of 100 per day. After the ten days of preadaptation to M9+ medium, we selected a single clone and propagated for 24 hours in M9+ in the absence of antibiotic. We then subcultured this population into twenty replicate populations. Ten of the populations (5 planktonic and 5 biofilm) were propagated every 24 hours in constant subinhibitory concentrations of CIP, 0.0625 mg/L, which corresponds to 0.5x the minimum inhibitory concentration (MIC). After 72 hours under subinhibitory concentrations of CIP, the populations were exposed to two different antibiotic regimes for 9 more days, either constant subinhibitory concentrations of CIP or increasing concentrations of CIP (called the evolutionary rescue). For the latter, we doubled the CIP concentrations every 72 hours until 4x MIC. As a control, the 20 remaining populations were propagated in the absence of CIP (Figure 1). We propagated the populations into fresh media every 24 hours as described by Turner et al. 2018 (37). For planktonic populations, we transferred a 1:100 (50 µl into 5 ml of M9+) dilution, which corresponded to 6.64 generations per day. For biofilm populations, we transferred a polystyrene bead (Polysciences, Inc., Warrington. PA) to fresh media containing three sterile beads. We rinsed each bead in PBS before the transfer, therefore reducing the transfer of planktonic cells. Each day we alternated between black and white marked beads, ensuring that the bacteria were growing on the bead for 24 hours, which corresponds to approximately 6 to 7.5 generations/day (13, 37). For the experiment with increasing concentrations of antibiotics, we froze a sample of each bacterial population on days 1, 3, 4, 6, 7, 9, 10 and 12. In the experiment with constant exposure to subinhibitory concentrations of antibiotics, we froze the populations on days 1, 3, 4, 9, and 12. We froze the control populations at days 1, 4, 9, and 12. For planktonic populations, we froze 1 mL of culture with 9% of DMSO. For freezing the biofilm populations, we sonicated the beads in 1 mL of PBS with a probe sonicator and subsequently froze with 9% DMSO. We determined the MIC of CIP of the whole population by broth microdilution in M9+ according to the Clinical and Laboratory Standards Institute guidelines (42), in which each bacterial sample was tested to 2-fold-increasing concentration of CIP from 0.0625 to 64 mg/L. To obtain a general picture of the resistance profiles we determined the MIC to 23 antibiotics (amikacin, ampicillin, ampicillin/sulbactam, aztreonam, cefazolin, cefepime, cephalothin, meropenem, ertapenem, cefuroxime, gentamicin, CIP, piperacillin/tazobactam, cefoxitin, trimethoprim/sulfamethoxazole, cefpodoxime, ceftazidime, tobramycin, tigecycline, ticarcillin/clavulanic acid, ceftriaxone and tetracycline) by broth microdilution in commercial microtiter plates following the instructions provided by the manufacturers (Sensititre GN3F, Trek Diagnostics Inc., Westlake, OH). We tested the MIC at days 1, 3, 4, 6, 7, 9, 10 and 12 for the populations propagated under increasing concentrations of antibiotic, and at days 1 and 12 for the subinhibitory and non-antibiotic treatments. For the CIP-MICs, we used Pseudomonas aeruginosa PAO1 in Mueller Hinton broth as a control. No differences in the MICs were found between Mueller Hinton and M9+ or if measuring the MIC in 96 well-plate or in 5 ml tubes, which are the experimental conditions. Each MIC was performed in triplicate. The CIP was provided by Alfa Aesar (Alfa Aesar, Wardhill, MA). We estimated the biofilm formation of the selected clones using a modification of the previously described protocol (99). We resurrected each clone in 5 mL of M9+ containing 0.5 mg/L of CIP and grew them for 24 hours. For each strain, we transferred 50 µl into 15 ml of M9+. We tested 200 µl of the previous dilution of each clone to 4 different subinhibitory CIP concentrations (0 mg/L, 0.01 mg/L, 0.03 mg/L and 0.0625 mg/L). After 24 hours of growing at 37ºC, we measured population sizes by optical density (OD) at 590nm (ODPopulations). Then, we added 250 µl of 0.1% crystal violet and incubated at room temperature for 15 minutes. After washing the wells and drying for 24 hours, we added 250 µl 95% EtOH solution (95% EtOH, 4.95% dH2O, 0.05% Triton X-100) to each well and incubated for 15 minutes and biofilm formation was measured by the OD at 590nm (ODBiofilm). Biofilm formation was corrected by population sizes (ODBiofilm/ODPopulation). Results are the average of three experiments (Figure S3). We selected 5 biofilm and 5 planktonic clones at the end of the evolutionary rescue experiment (Figure 2) and determined the fitness by directly competing the ancestral strain and the evolved clone variants both in planktonic and in biofilm conditions (Figure 3) (37). We revived each clone from a freezer stock in M9+ for 24 hours. We maintained the same evolutionary conditions to revive the clones, adding 3 beads and/or CIP to the broth when required. After 24 hours, we added equal volume of the clones and the ancestors in M9+ in the absence of antibiotics. For planktonic populations, we mixed 25 µl of each competitor in 5 ml of M9+. For biofilm competitions, we sonicated one bead per competitor in 1 ml of PBS and mixed in 5 ml of M9+ containing 3 beads. The mix was cultured at 37ºC for 24 hours. We plated at time zero and after 24 hours. For each competition, we plated aliquots onto nonselective tryptic soy agar and tryptic soy agar containing CIP. Selection rate (r) was calculated as the difference of the Malthusian parameters for the two competitors: r = (ln(CIP resistantd=1/CIP resistantd=0))/(ln(CIP susceptibled=1/CIP susceptibled=0))/day (100). Susceptible populations were calculated as the difference between the total populations (number of colonies/mL growing on the nonselective plates) and the resistant fraction (number of colonies/mL growing on the plates containing CIP). As a control for calculating the correct ratio of susceptible vs. resistant populations, we replica plated 50 to 100 colonies from the nonselective plates onto plates containing CIP as previously described (101). Results are the average of three to five independent experiments. We sequenced whole populations of three evolving replicates per treatment. We sequenced the populations at days 1, 3, 4, 6, 7, 9, 10, and 12 of the populations under increasing concentrations of CIP (hereafter populations P1, P2, P3 and B1, B2, B3 for planktonic and biofilm populations) and at days 1, 4, 9, and 12 of the populations under subinhibitory concentration and no antibiotic treatments. In addition, we selected 49 clones for sequencing at the end of the experiment (Figure 2F). 12 of the clones were recovered from the populations propagated in the absence of the antibiotic, 12 clones from the subinhibitory concentrations of CIP treatment and 25 were isolated from the increasing concentrations of antibiotic. We revived each population or clone from a freezer stock in the growth conditions under which they were isolated (i.e. the same CIP concentration which they were exposed to during the experiment) and grew for 24 hours. DNA was extracted using the Qiagen DNAeasy Blood and Tissue kit (Qiagen, Hiden, Germany). The sequencing library was prepared as described by Turner and colleagues (37) according to the protocol of Baym et al. (102), using the Illumina Nextera kit (Illumina Inc., San Diego, CA) and sequenced using an Illumina NextSeq500 at the Microbial Genome Sequencing center (http://micropopbio.org/sequencing.html). All sequences were first quality filtered and trimmed with the Trimmomatic software v0.36 (103) using the criteria: LEADING:20 TRAILING:20 SLIDINGWINDOW:4:20 MINLEN:70. Variants were called with the breseq software v0.31.0 (104) using the default parameters and the -p flag when required for identifying polymorphisms in populations. The reference genome used for variant calling was downloaded from the NCBI RefSeq database using the 17-Mar-2017 version of A. baumannii ATCC 17978-mff complete genome (GCF_001077675.1). In addition to the chromosome NZ_CP012004 and plasmid NZ_CP012005 sequences, we added two additional plasmid sequences to the reference genome that are known to be present in our working strain of A. baumannii ATCC 17978-mff: NC009083, NC_009084. Mutations were then manually curated and filtered to remove false positives. Mutations were filtered if the gene was found to contain a mutation when the ancestor sequence was compared to the reference genome or if a mutation never reached a cumulative frequency of 10% across all replicate populations. Diversity measurements were made in R using the Shannon index considering the presence, absence, and frequency of alleles. Significant differences between biofilm and planktonic populations were determined by the Kruskal Wallis test. Filtering, mutational dynamics, and plotting were done in R v3.4.4 (www.r-project.org) with the packages ggplot2 v2.2.1 (https://CRAN.R-project.org/package=ggplot2), dplyr v0.7.4 (https://CRAN.R-project.org/package=dplyr), and vegan v2.5-1 (https://github.com/vegandevs/vegan). R code for filtering and data processing can be found here: https://github.com/sirmicrobe/U01_allele_freq_code. All sequences were deposited into NCBI under the Biosample accession numbers SAMN09783599-SAMN09783682. We thank Caroline B. Turner for helpful discussions and proofreading of the paper and Allison L. Welp for laboratory assistance. This research was supported by NIH U01AI124302-01. O’Neill J (2016) TACKLING DRUG-RESISTANT INFECTIONS GLOBALLY: FINAL REPORT AND RECOMMENDATIONS. Review on Antimicrobal Resistance. Martínez JL (2008) Antibiotics and Antibiotic Resistance Genes in Natural Environments. Science 321(5887):365–367. Ventola CL (2015) The antibiotic resistance crisis: part 1: causes and threats. P T 40(4):277–283. Doi Y, Murray GL, & Peleg AY (2015) Acinetobacter baumannii: evolution of antimicrobial resistance-treatment options. Semin Respir Crit Care Med 36(1):85–98. Asif M, Alvi IA, & Rehman SU (2018) Insight into Acinetobacter baumannii: pathogenesis, global resistance, mechanisms of resistance, treatment options, and alternative modalities. Infect Drug Resist 11:1249–1260. Eze EC, Chenia HY, & El Zowalaty ME (2018) Acinetobacter baumannii biofilms: effects of physicochemical factors, virulence, antibiotic resistance determinants, gene regulation, and future antimicrobial treatments. Infect Drug Resist 11:2277–2299. Hoiby N, Bjarnsholt T, Givskov M, Molin S, & Ciofu O (2010) Antibiotic resistance of bacterial biofilms. Int J Antimicrob Agents 35(4):322–332. Olsen I (2015) Biofilm-specific antibiotic tolerance and resistance. Eur J Clin Microbiol Infect Dis 34(5):877–886. Ahmed MN, Porse A, Sommer MOA, Hoiby N, & Ciofu O (2018) Evolution of antibiotic resistance in biofilm and planktonic P. aeruginosa populations exposed to sub-inhibitory levels of ciprofloxacin. Antimicrob Agents Chemother. Walters MC, 3rd., Roe F, Bugnicourt A, Franklin MJ, & Stewart PS (2003) Contributions of antibiotic penetration, oxygen limitation, and low metabolic activity to tolerance of Pseudomonas aeruginosa biofilms to ciprofloxacin and tobramycin. Antimicrob Agents Chemother 47(1):317–323. Wistrand-Yuen E, et al. (2018) Evolution of high-level resistance during low-level antibiotic exposure. Nat Commun 9(1):1599. Andersson DI & Hughes D (2014) Microbiological effects of sublethal levels of antibiotics. Nat Rev Microbiol 12(7):465–478. Traverse CC, Mayo-Smith LM, Poltak SR, & Cooper VS (2013) Tangled bank of experimentally evolved Burkholderia biofilms reflects selection during chronic infections. Proc Natl Acad Sci U S A 110(3):E250–259. Cooper VS, Staples RK, Traverse CC, & Ellis CN (2014) Parallel evolution of small colony variants in Burkholderia cenocepacia biofilms. Genomics 104(6 Pt A):447–452. Ellis CN, Traverse CC, Mayo-Smith L, Buskirk SW, & Cooper VS (2015) Character displacement and the evolution of niche complementarity in a model biofilm community. Evolution 69(2):283–293. France MT, Cornea A, Kehlet-Delgado H, & Forney LJ (2019) Spatial structure facilitates the accumulation and persistence of antibiotic-resistant mutants in biofilms. Evolutionary Applications 12(3):498–507. Poltak SR & Cooper VS (2011) Ecological succession in long-term experimentally evolved biofilms produces synergistic communities. ISME J 5(3):369–378. Frenkel EM, et al. (2015) Crowded growth leads to the spontaneous evolution of semistable coexistence in laboratory yeast populations. Proc Natl Acad Sci U S A 112(36):11306–11311. Fux CA, Costerton JW, Stewart PS, & Stoodley P (2005) Survival strategies of infectious biofilms. Trends Microbiol 13(1):34–40. Arnold SJ (1992) Constraints on phenotypic evolution. Am Nat 140 Suppl 1:S85–107. Pavličev M & Cheverud JM (2015) Constraints Evolve: Context Dependency of Gene Effects Allows Evolution of Pleiotropy. Annual Review of Ecology, Evolution, and Systematics 46(1):413–434. Saltz JB, Hessel FC, & Kelly MW (2017) Trait Correlations in the Genomics Era. Trends Ecol Evol 32(4):279–290. Wolcott RD (2017) Biofilms cause chronic infections. J Wound Care 26(8):423–425. Wolcott RD, et al. (2010) Chronic wounds and the medical biofilm paradigm. J Wound Care 19(2):45–46, 48-50, 52-43. Geisinger E & Isberg RR (2015) Antibiotic modulation of capsular exopolysaccharide and virulence in Acinetobacter baumannii. PLoS Pathog 11(2):e1004691. Ridenhour BJ, et al. (2017) Persistence of antibiotic resistance plasmids in bacterial biofilms. Evol Appl 10(6):640–647. Hughes D & Andersson DI (2017) Evolutionary Trajectories to Antibiotic Resistance. Annu Rev Microbiol. Baym M, et al. (2016) Spatiotemporal microbial evolution on antibiotic landscapes. Science 353(6304):1147–1151. Piechaud M & Second L (1951) [Studies of 26 strains of Moraxella Iwoffi]. Annales de l’Institut Pasteur 80(1):97–99. Baumann P, Doudoroff M, & Stanier RY (1968) A study of the Moraxella group. II. Oxidative-negative species (genus Acinetobacter). J Bacteriol 95(5):1520–1541. Bell G & Gonzalez A (2009) Evolutionary rescue can prevent extinction following environmental change. Ecol Lett 12(9):942–948. Lopes BS & Amyes SG (2013) Insertion sequence disruption of adeR and ciprofloxacin resistance caused by efflux pumps and gyrA and parC mutations in Acinetobacter baumannii. Int J Antimicrob Agents 41(2):117–121. Ardebili A, Lari AR, & Talebi M (2014) Correlation of ciprofloxacin resistance with the AdeABC efflux system in Acinetobacter baumannii clinical isolates. Annals of laboratory medicine 34(6):433–438. Tseng BS, et al. (2013) The extracellular matrix protects Pseudomonas aeruginosa biofilms by limiting the penetration of tobramycin. Environ Microbiol 15(10):2865–2878. Kirby AE, Garner K, & Levin BR (2012) The relative contributions of physical structure and cell density to the antibiotic susceptibility of bacteria in biofilms. Antimicrob Agents Chemother 56(6):2967–2975. Aka ST & Haji SH (2015) Sub-MIC of antibiotics induced biofilm formation of Pseudomonas aeruginosa in the presence of chlorhexidine. Braz J Microbiol 46(1):149–154. Turner CB, Marshall CW, & Cooper VS (2018) Parallel genetic adaptation across environments differing in mode of growth or resource availability. Evolution Letters 2(4):355–367. Cooper VS (2018) Experimental Evolution as a High-Throughput Screen for Genetic Adaptations. mSphere 3(3). Salverda MLM, Koomen J, Koopmanschap B, Zwart MP, & de Visser J (2017) Adaptive benefits from small mutation supplies in an antibiotic resistance enzyme. Proc Natl Acad Sci U S A 114(48):12773–12778. Oz T, et al. (2014) Strength of selection pressure is an important parameter contributing to the complexity of antibiotic resistance evolution. Mol Biol Evol 31(9):2387–2401. Maclean RC, Hall AR, Perron GG, & Buckling A (2010) The evolution of antibiotic resistance: insight into the roles of molecular mechanisms of resistance and treatment context. Discov Med 10(51):112–118. CLSI (2017) CLSI. Clinical and Laboratory Standars Institute. Performance Standards for Antimicrobial Susceptibility Testing-Seventeenth edition: Approved Standar M100-S17. (CLSI, Wayne, PA, USA). Wang Y-C, et al. (2018) Biofilm formation is not associated with worse outcome in Acinetobacter baumannii bacteraemic pneumonia. Scientific Reports 8(1):7289. Borriello G, et al. (2004) Oxygen limitation contributes to antibiotic tolerance of Pseudomonas aeruginosa in biofilms. Antimicrob Agents Chemother 48(7):2659–2664. Hill D, et al. (2005) Antibiotic Susceptibilities of Pseudomonas aeruginosa Isolates Derived from Patients with Cystic Fibrosis under Aerobic, Anaerobic, and Biofilm Conditions. Journal of Clinical Microbiology 43(10):5085–5090. Barrick JE & Lenski RE (2013) Genome dynamics during experimental evolution. Nature reviews. Genetics 14:827–839. Bolnick DI, Barrett RDH, Oke KB, Rennison DJ, & Stuart YE (2018) (Non)Parallel Evolution. Annual Review of Ecology, Evolution, and Systematics 49(1):303–330. Barrick JE, et al. (2009) Genome evolution and adaptation in a long-term experiment with Escherichia coli. Nature 461:1243–1247. Dillon MM, Sung W, Sebra R, Lynch M, & Cooper VS (2017) Genome-Wide Biases in the Rate and Molecular Spectrum of Spontaneous Mutations in Vibrio cholerae and Vibrio fischeri. Mol Biol Evol 34(1):93–109. Lynch M, et al. (2016) Genetic drift, selection and the evolution of the mutation rate. Nature Reviews Genetics 17:704. Kröger C, et al. (2018) The primary transcriptome, small RNAs and regulation of antimicrobial resistance in Acinetobacter baumannii ATCC 17978. Nucleic Acids Res 46(18):9684–9698. Khan GA, Berglund B, Khan KM, Lindgren PE, & Fick J (2013) Occurrence and abundance of antibiotics and resistance genes in rivers, canal and near drug formulation facilities--a study in Pakistan. PLoS One 8(6):e62712. Baquero F, Negri MC, Morosini MI, & Blazquez J (1998) Antibiotic-selective environments. Clin Infect Dis 27 Suppl 1:S5–11. Coyne S, Rosenfeld N, Lambert T, Courvalin P, & Perichon B (2010) Overexpression of resistance-nodulation-cell division pump AdeFGH confers multidrug resistance in Acinetobacter baumannii. Antimicrob Agents Chemother 54(10):4389–4393. Fernando D, Zhanel G, & Kumar A (2013) Antibiotic resistance and expression of resistance-nodulation-division pump- and outer membrane porin-encoding genes in Acinetobacter species isolated from Canadian hospitals. Can J Infect Dis Med Microbiol 24(1):17–21. Pournaras S, Koumaki V, Gennimata V, Kouskouni E, & Tsakris A (2016) In Vitro Activity of Tigecycline Against Acinetobacter baumannii: Global Epidemiology and Resistance Mechanisms. Adv Exp Med Biol 897:1–14. Li X-Z, Elkins CA, & Zgurskaya HI (2016) Efflux-Mediated Antimicrobial Resistance in Bacteria: Mechanisms, Regulation and Clinical Implications (Springer). Hua X, Chen Q, Li X, & Yu Y (2014) Global transcriptional response of Acinetobacter baumannii to a subinhibitory concentration of tigecycline. Int J Antimicrob Agents 44(4):337–344. Su XZ, Chen J, Mizushima T, Kuroda T, & Tsuchiya T (2005) AbeM, an H+-coupled Acinetobacter baumannii multidrug efflux pump belonging to the MATE family of transporters. Antimicrob Agents Chemother 49(10):4362–4364. Desai MM & Fisher DS (2007) Beneficial mutation selection balance and the effect of linkage on positive selection. Genetics 176(3):1759–1798. Vogwill T & MacLean RC (2015) The genetic basis of the fitness costs of antimicrobial resistance: a meta-analysis approach. Evol Appl 8(3):284–295. Moore FB, Rozen DE, & Lenski RE (2000) Pervasive compensatory adaptation in Escherichia coli. Proc Biol Sci 267(1442):515–522. Zhao X & Drlica K (2002) Restricting the selection of antibiotic-resistant mutant bacteria: measurement and potential use of the mutant selection window. J Infect Dis 185(4):561–565. Marcusson LL, Frimodt-Moller N, & Hughes D (2009) Interplay in the selection of fluoroquinolone resistance and bacterial fitness. PLoS Pathog 5(8):e1000541. Huseby DL, et al. (2017) Mutation Supply and Relative Fitness Shape the Genotypes of Ciprofloxacin-Resistant Escherichia coli. Mol Biol Evol 34(5):1029–1039. Basra P, et al. (2018) Fitness tradeoffs of antibiotic resistance in extra-intestinal pathogenic Escherichia coli. Genome Biol Evol. Kugelberg E, Lofmark S, Wretlind B, & Andersson DI (2005) Reduction of the fitness burden of quinolone resistance in Pseudomonas aeruginosa. J Antimicrob Chemother 55(1):22–30. Sackman AM & Rokyta DR (2018) Additive Phenotypes Underlie Epistasis of Fitness Effects. Genetics 208(1):339–348. Baym M, Stone LK, & Kishony R (2016) Multidrug evolutionary strategies to reverse antibiotic resistance. Science 351(6268):aad3292. Pal C, Papp B, & Lazar V (2015) Collateral sensitivity of antibiotic-resistant microbes. Trends Microbiol 23(7):401–407. Podnecky NL, et al. (2018) Conserved collateral antibiotic susceptibility networks in diverse clinical strains of Escherichia coli. Nature Communications 9(1):3673. Yen P & Papin JA (2017) History of antibiotic adaptation influences microbial evolutionary dynamics during subsequent treatment. PLoS Biol 15(8):e2001586. Barbosa C, et al. (2017) Alternative Evolutionary Paths to Bacterial Antibiotic Resistance Cause Distinct Collateral Effects. Mol Biol Evol 34(9):2229–2244. Leus IV, et al. (2018) Substrate specificities and efflux efficiencies of RND efflux pumps of Acinetobacter baumannii. J Bacteriol. Li XZ, Elkins CA, & Zgurskaya HI (2016) Efflux-Mediated Antimicrobial Resistance in Bacteria: Mechanisms, Regulation and Clinical Implications (Springer International Publishing). Coyne S, Courvalin P, & Perichon B (2011) Efflux-mediated antibiotic resistance in Acinetobacter spp. Antimicrob Agents Chemother 55(3):947–953. Yoon EJ, et al. (2015) Contribution of resistance-nodulation-cell division efflux systems to antibiotic resistance and biofilm formation in Acinetobacter baumannii. MBio 6(2). Azimi L & Rastegar Lari A (2017) Collateral sensitivity between aminoglycosides and beta-lactam antibiotics depends on active proton pumps. Microb Pathog 112:122–125. Kim S, Lieberman TD, & Kishony R (2014) Alternating antibiotic treatments constrain evolutionary paths to multidrug resistance. Proc Natl Acad Sci U S A 111(40):14494–14499. Imamovic L & Sommer MO (2013) Use of collateral sensitivity networks to design drug cycling protocols that avoid resistance development. Science translational medicine 5(204):204ra132. Nichol D, et al. (2019) Antibiotic collateral sensitivity is contingent on the repeatability of evolution. Nature Communications 10(1):334. Dhawan A, et al. (2017) Collateral sensitivity networks reveal evolutionary instability and novel treatment strategies in ALK mutated non-small cell lung cancer. Sci Rep 7(1):1232. Yang H, Hu L, Liu Y, Ye Y, & Li J (2016) Detection of the plasmid-mediated quinolone resistance determinants in clinical isolates of Acinetobacter baumannii in China. J Chemother 28(5):443–445. Adams-Haduch JM, et al. (2008) Genetic basis of multidrug resistance in Acinetobacter baumannii clinical isolates at a tertiary medical center in Pennsylvania. Antimicrob Agents Chemother 52(11):3837–3843. Warner WA, et al. (2016) Molecular characterization and antimicrobial susceptibility of Acinetobacter baumannii isolates obtained from two hospital outbreaks in Los Angeles County, California, USA. BMC Infect Dis 16:194. Dahdouh E, et al. (2017) Clonality, virulence determinants, and profiles of resistance of clinical Acinetobacter baumannii isolates obtained from a Spanish hospital. PLoS One 12(4):e0176824. Damier-Piolle L, Magnet S, Bremont S, Lambert T, & Courvalin P (2008) AdeIJK, a resistance-nodulation-cell division pump effluxing multiple antibiotics in Acinetobacter baumannii. Antimicrob Agents Chemother 52(2):557–562. Rosenfeld N, Bouchier C, Courvalin P, & Perichon B (2012) Expression of the resistance-nodulation-cell division pump AdeIJK in Acinetobacter baumannii is regulated by AdeN, a TetR-type regulator. Antimicrob Agents Chemother 56(5):2504–2510. He X, et al. (2015) Biofilm Formation Caused by Clinical Acinetobacter baumannii Isolates Is Associated with Overexpression of the AdeFGH Efflux Pump. Antimicrob Agents Chemother 59(8):4817–4825. Alav I, Sutton JM, & Rahman KM (2018) Role of bacterial efflux pumps in biofilm formation. J Antimicrob Chemother 73(8):2003–2020. Olivares Pacheco J, Alvarez-Ortega C, Alcalde Rico M, & Martínez JL (2017) Metabolic Compensation of Fitness Costs Is a General Outcome for Antibiotic-Resistant Pseudomonas aeruginosa Mutants Overexpressing Efflux Pumps. mBio 8(4):e00500–00517. Warner DM, Folster JP, Shafer WM, & Jerse AE (2007) Regulation of the MtrC-MtrD-MtrE efflux-pump system modulates the in vivo fitness of Neisseria gonorrhoeae. J Infect Dis 196(12):1804–1812. Elena SF & Lenski RE (2003) Evolution experiments with microorganisms: the dynamics and genetic bases of adaptation. Nature Reviews Genetics 4:457. Van den Bergh B, Swings T, Fauvart M, & Michiels J (2018) Experimental Design, Population Dynamics, and Diversity in Microbial Experimental Evolution. Microbiology and Molecular Biology Reviews 82(3):e00008–00018. Geisinger E, et al. (2018) The landscape of intrinsic and evolved fluoroquinolone resistance in Acinetobacter baumannii includes suppression of drug-induced prophage replication. bioRxiv:442681. Hamed K & Debonnett L (2017) Tobramycin inhalation powder for the treatment of pulmonary Pseudomonas aeruginosa infection in patients with cystic fibrosis: a review based on clinical evidence. Therapeutic advances in respiratory disease 11(5):193–209. Linares JF, Gustafsson I, Baquero F, & Martinez JL (2006) Antibiotics as intermicrobial signaling agents instead of weapons. Proc Natl Acad Sci U S A 103(51):19484–19489. Hoffman LR, et al. (2005) Aminoglycoside antibiotics induce bacterial biofilm formation. Nature 436(7054):1171–1175. O’Toole GA & Kolter R (1998) Initiation of biofilm formation in Pseudomonas fluorescens WCS365 proceeds via multiple, convergent signalling pathways: a genetic analysis. Mol Microbiol 28(3):449–461. Lenski RE (1991) Quantifying fitness and gene stability in microorganisms. Biotechnology 15:173–192. Santos-Lopez A, et al. (2017) A Naturally Occurring Single Nucleotide Polymorphism in a Multicopy Plasmid Produces a Reversible Increase in Antibiotic Resistance. Antimicrob Agents Chemother 61(2). Baym M, et al. (2015) Inexpensive multiplexed library preparation for megabase-sized genomes. PLoS One 10(5):e0128036. Bolger AM, Lohse M, & Usadel B (2014) Trimmomatic: a flexible trimmer for Illumina sequence data. Bioinformatics 30(15):2114–2120. Deatherage DE & Barrick JE (2014) Identification of mutations in laboratory-evolved microbes from next-generation sequencing data using breseq. Methods Mol Biol 1151:165–188.